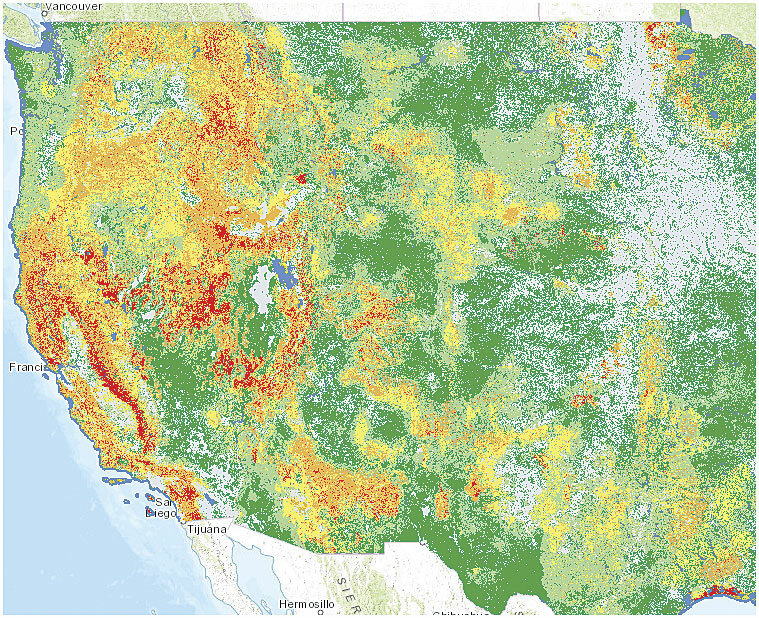 James E. Hubbard, the deputy chief for state and private forestry for the US Forest Service, believes that GIS is the key to forest management. Forests in the United States are under threat. Fire is changing the nation's forest landscape, while forest health is succumbing to warmer weather patterns. 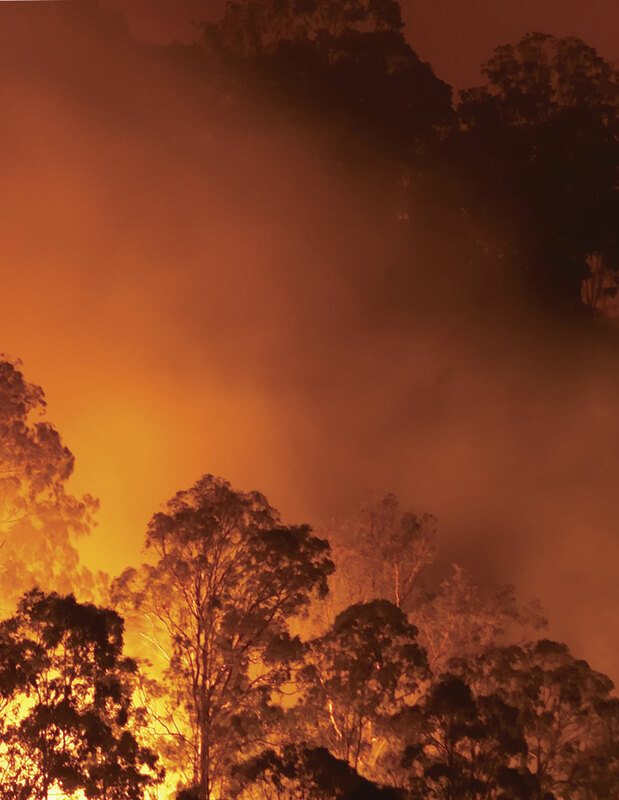 Faced with challenges of such magnitude, James E. Hubbard, the deputy chief for state and private forestry for the US Forest Service (USFS), believes that GIS is the key to forest management. "Natural resource management in the United States, and particularly forest management, would not be possible today without GIS," he said. Hubbard is responsible for fire and aviation management, cooperative forestry programs, forest health protection, conservation education, urban and community forestry, and the Office of Tribal Relations. He formulates his thinking on the premise that everything in the forest is geographically based. Thus, decision-making processes—from planning fire management to policy making—must incorporate scientific geographic analysis. "GIS is mission critical for fire management and response," Hubbard said. Having direct responsibility for 193 million acres of national forest (which is just a small part of the nation's total forestland), the USFS reaches out to private forestland owners to help them manage their properties more effectively. The agency also works with communities to aid them in building public policy. And GIS underpins all this work. 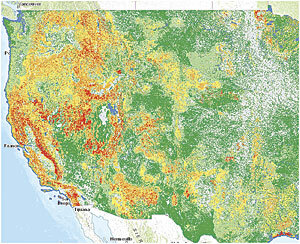 The US Forest Service produces maps that display insect and disease risk, such as this one for the Pacific Northwest. Stripes denote wilderness lands, and red indicates infestation. Today, forest fires are hotter and bigger than they used to be, and real estate is more at risk. Firefighting has become more complex and expensive, and firefighting practices need to be on the cutting edge. Consider air tankers, one of the Forest Service's primary fire attack resources. They drop fire retardant to keep fires from spreading. But some forest animals can't tolerate the pink slurry. While the retardant can keep flames from spreading across the forest canopy, it can be harmful if washed into streams that are home to endangered species, such as the bull trout. Air tanker pilots need to avoid waterways so that their retardant doesn't negatively impact species. They also need to keep it away from areas where rainfall could wash the retardant down into streams with sensitive fish populations. Avoiding waterways seems simple enough. But during a fire, vegetation and smoke obstruct ground visibility. This complicates the mission. To assist, the USFS creates maps that show where endangered species are located and where fire retardant could be washed into their habitats. 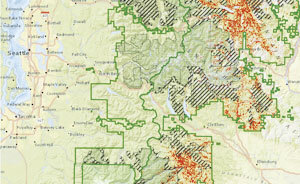 Using endangered species data from the US Fish and Wildlife Service—along with waterway data; topographic information; and (if available) information on terrain pitch, existing contaminated areas, wind, and drift—the Forest Service generates ArcGIS maps that show the areas pilots should stay away from. The agency then loads the resultant app onto a laptop that pilots carry with them so they can see pertinent information for any section of ground they cover. To keep track of environmental impacts, the USFS maps out where fire retardant was dropped as well. The Forest Service also partners with the US Department of the Interior in the LANDFIRE program, a decision support system for wildfire management. Using GIS to manage annually updated survey data, the program produces maps about vegetation and fire fuel characteristics across the country. It includes weather factors and predicts potential wildfire activity 10 days out. With LANDFIRE, firefighters and land managers know what to expect, which actions to take, and their probability of success. They know how to best position fire suppression resources and set priorities for hazard reduction activities, such as removing fuel and conducting controlled burns. All that leads to better approaches to fighting fires, managing risk, and ensuring successful outcomes. Additionally, when a wildfire is burning, nearby residents want to know where the fire is headed, how much of it has been contained, where to evacuate, and how long it will be until they can return to their homes. The Forest Service provides fire risk information to communities affected by specific wildfires, keeping the public informed during the fire rather than having everyone wait until the fire is out. To do this, the USFS distributes status information via ArcGIS for Server and conveys that data through web apps built on Esri technology. 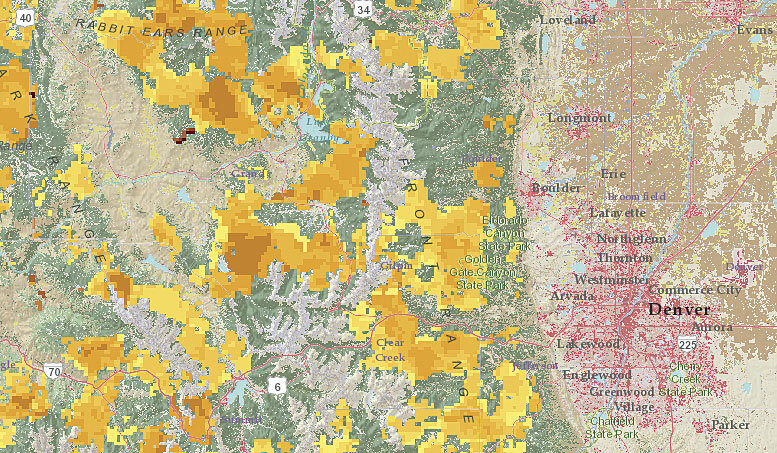 The Forest Service's Active Fire Mapping Program website, for example, contains maps, satellite fire detection data, and fire data web services that the public can access anytime. 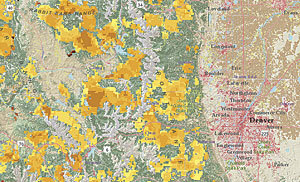 The Wildfire Hazard Potential map helps firefighters and land managers set priorities for hazard-reduction activities. Monitoring forest health is another major Forest Service endeavor. Forests evolve and require distinct management approaches at different stages of life. A forest that has been burned, for example, is less vigorous and at greater risk of fire. Forests at the onset of regeneration are prone to attracting insects and disease. New forests also consist of different vegetation than the ones that preceded them, meaning that they require new management strategies. Each year, the USFS creates a forest health assessment for 500 million acres of forestland that shows statuses, trends, and changes. ArcGIS drives these assessments by keeping track of ground plots and surveys, aerial surveys, and other data sources. With this information, the USFS studies forest change and analyzes causes and effects, ultimately evaluating forest resilience. Using 85 years' worth of forest data—plus the geospatial information contained in LANDFIRE—the Forest Inventory and Analysis Program (FIA) produces hundreds of geospatial models that show forest change over time and what is currently happening with the nation's forests. It also compiles projection models that illustrate a forest's future. With this, the USFS brings scientific information to the table for policy building that is digestible. "GIS is becoming the underpinning of the dialog that has to occur in order for Congress, the administration, and public land managers to make decisions," Hubbard said. "Decision makers feel good about that kind of dialog. It gets people who have different views, principles, and expectations to find common ground and move forward." Addressing policies on wildfires, forest health, and climate change must be done on a large scale—on the level of the whole landscape. Maps open a discourse with federal and state legislatures. They create the basis for talking with national forest supervisors about federal priorities and understanding the reasons why one area might be more important than another. Maps also help forest managers pick topics specific to a particular region and open them up for discussion with the community. 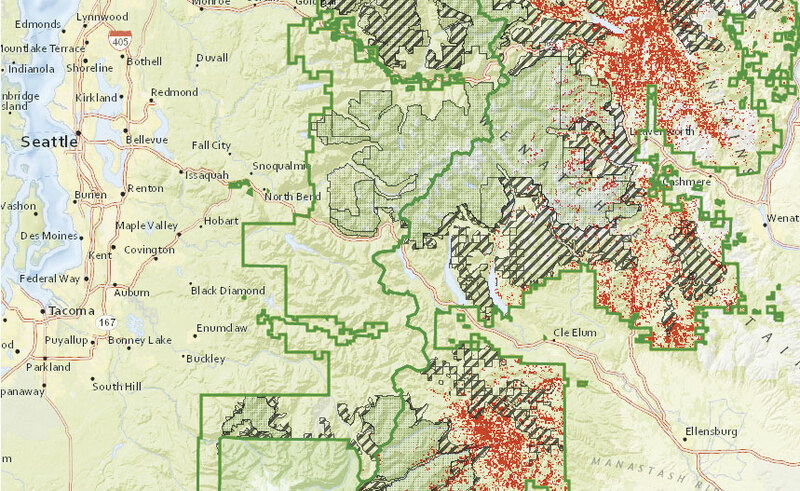 Using maps like this one, which illustrates fire potential and forest risks from insects and disease, the USFS helps private forestland owners manage their properties and works with communities to build public policy. For private landowners to envision the environment beyond their own properties, their land needs to be put into context. At one time, Forest Service managers wrote their forest plans before inviting people to talk about them. These plans were built on managers' interpretation rather than taking everyone's concerns into account. Sometimes, when people didn't like the plan, they would challenge the Forest Service's management actions—even to the point of going to court to stop the agency from implementing its plans. Most USFS managers don't take this approach anymore, though. Instead, the agency's larger picture is drawn from real data and mapped in a way that people can understand it, talk about it, and interact with it. For example, the USFS created an insect- and disease-risk story map that is publicly accessible. The map spans the United States, and users can click on various locations to see insects that affect forests in those areas and learn about diseases that are contributing to forest decline. Tools like this help foresters have dialog with the public before creating their plans. And, according to Hubbard, the USFS could not have opened up discussions without GIS. "It helps people visualize, understand, [and] see the differences, trade-offs, and opinions," said Hubbard. "It enables them to come together and mutually decide on the outcomes they want." With GIS contextualizing forestland dynamics for land managers, firefighters, policy makers, and the public, everyone is more capable of protecting and preserving America's forests as well as preparing for any more changes to come.